Southern traditions. I participate in a few of them, including the ritualistic eating of black eyed peas on New Years. Ok, maybe that's the only one I consciously participate in. But I do meet a lot of Southerners at work, who invariably give me great ideas for recipes. Like creamed corn. I HAVE NEVER HAD CREAMED CORN BEFORE. I know, you guys, I'm a traitor to Virginia tradition (or something like that). However, I have eaten many a cohn pohn (corn bread) in my lifetime. And I relish summer corn as do all Americans. Eaten with butter and cayenne, I'm happy as a baby duck in a kiddy pool. I am presuming baby ducks are happy anytime they get to chill in little bodies of water, basically. But that's beside the point. Corn bread, corn pudding, corn grits, corn-on-the-cob: all of it is yes. But creamed corn? It sounds almost strange to me. As if it's so old school that it's itching for a comeback. A creamy, cashewy, drunken comeback. The traditional recipe for this calls for heavy cream, which adds that buttery-sweetness to the already summer sweet corn. But we know how to solve that problem at Upbeet. Oh yes: cashew cream. Cashew cream (also knows as cashew butter) is one of those foods that obviates the existence of some food-loving gods. Ambrosia of the nut world, I use cashew cream to create the thick, smooth texture and flavor of cream-based dishes. Because of the high fat content of cashews (12 grams of fat per ounce) they work really well in both sweet and savory creamy dishes. 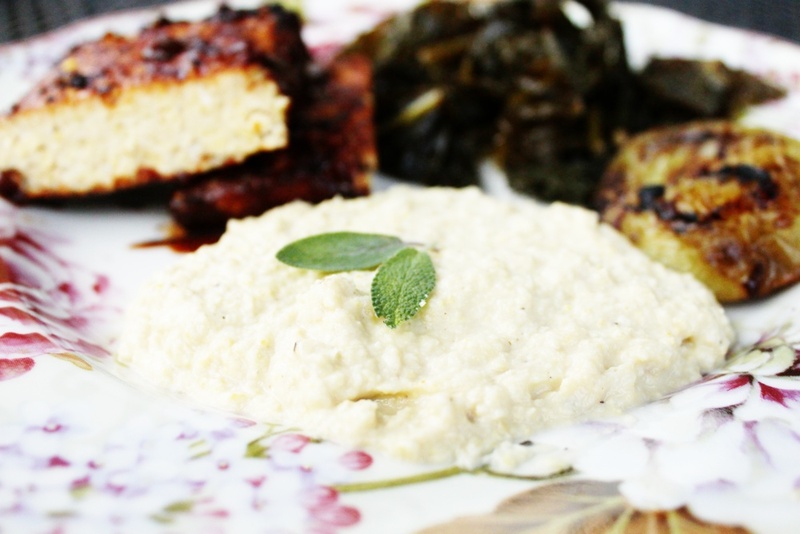 On the savory side, I have recently been stirring cashew cream into my grits (yum). On the sweet side, it makes home-made vanilla ice cream expletive-whispering-ly delicious. Cashews are high in magnesium, with 20% of the daily allowance present in a single ounce. Also, fun fact: cashews are not actually nuts, they're seeds. They come from the cashew apple, which looks like a tree-fruit version of a butternut squash with a funny green nose on the bottom. A slight a warning -- and not to ruin the cashew fun-times -- cashews are rather phlegmatic, meaning that they cause congestion and increase bile in the system. So, eat cashews in moderation, especially if you have a very low-fire digestive system (kapha) or high fire digestive system (pitta). Cashews are considered unbalancing for these types in Ayurveda. Really, only Vata (space/air) types are ok'd for munching their little hearts out on cashews. Also, if you suffer from sinus issues, or dairy-related allergies (often related to the phlegmatic nature of milk and creamy substances) eat cashews in moderation. Renee's notes: Although I quite enjoyed the novelty of cooking corn on the grill, if you would like to keep everything cooking in the same work-space certainly do so. This recipe works perfectly well when your corn is boiled or steamed on a conventional stove. Also, make sure to add only the minimum amount suggested of whiskey. It really shines through the sweetness of the corn and the creaminess of the cashew. 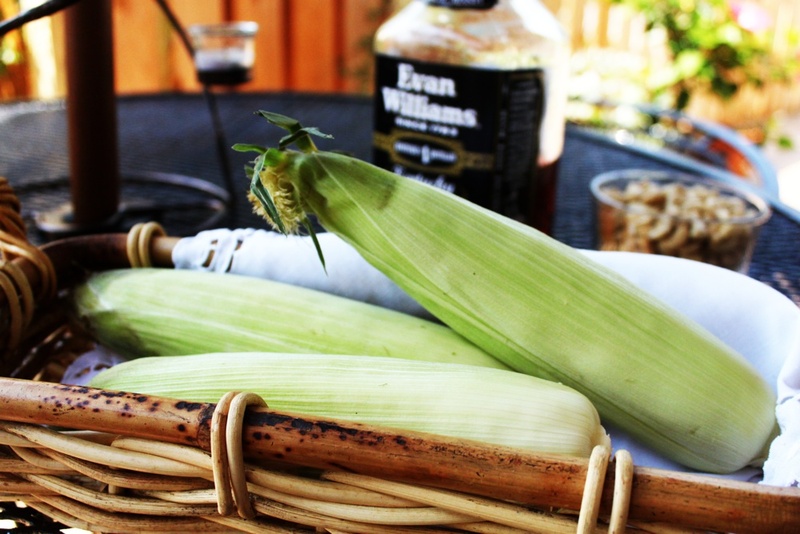 To prep the corn, trim down the stalks and remove a few layers of the corn husk. Leave most of the husk on. Fill a large bowl with water, and place the corn in the water. Soak for 20 minutes. Turn on your grill, and let it heat up for about ten minutes. Once the grill is nice and hot, take your soaked corn and place it on the grill. Pour 1/2 a cup of water over the grill, and quickly close the top to the grill. This steams the corn. Let cook for about 15 minutes, turning the corn over and adding more water half way through. While the corn is cooking, go ahead and prepare your cashew cream. Drain your soaked cashew, and place the cashews in a food processor with 1 teaspoon of water. Blend until they form a super-smooth paste. Let sit in the processor, as the corn will be added later. To check that the corn is done, remove an ear from the grill, let cool for a moment, and then peel back the husk. If the kernels are plump and juicy they're ready. If they are still hard, let steam longer. Remove all ears from the grill. Let cool 5 minutes. Peel the husks away. Cut the corn away from the cob using a sharp knife and place the corn in a medium sized bowl. Add your corn to the food processor with the cashews. Blend until a smooth, juicy creamed corn develops. Add 1 tablespoon of whiskey, salt, and as much pepper as your heart desires. This dish goes really well with sriracha & maple spiced soy chorizo, or with any spicy main dish. That's how I eat it!